If you find yourself with Mom in Los Angeles for Mother's Day, you can choose from a long list of dining options to celebrate her special day. Moms who enjoy doing more than eating might prefer a more active type of Mother's Day fun in Los Angeles. You can also start planning ahead for ​Father's Day in LA. Set sail on Mother's Day with a champagne brunch cruise or supper cruise in scenic Marina del Rey by Hornblower Cruises & Events. Brunch cruises typically depart at 9:30 a.m., 11 a.m., and 2 p.m. with boarding 30 minutes before departure times. The two-and-a-half-hour supper cruises depart at 4:30 p.m. and 6:30 p.m. You can choose your departure port from either Marina del Rey and Newport Beach. The cost ranges from $75 to $95 per person, depending on which cruise you select. The House of Blues hosts one seating at the famous Gospel Brunch at Anaheim GardenWalk. The gospel brunch begins at 10:30 a.m. and doors open 45 minutes before the show so you can get your food and get settled. Brunch is $45 and is well worth it for the show and the food. Light up Mom's evening with a matinee or night out at the theater with a Mother's Day With Elvis Concert featuring renowned Elvis impersonator Raymond Michael at Simi Valley Cultural Arts Center; or a French comedy called Boeing Boeing at the Morgan-Wixson Theatre in Santa Monica. You can find mostly discounted tickets for these and other shows at Goldstar. Surprise Mom with a mimosa and a snack, while she enjoys creating special Mother’s Day-themed pieces at Clay Ceramics Studio in Long Beach. During the two-hour sessions, moms have a blast with their kids creating beautiful one-of-a-kind pottery pieces using a pottery wheel. Learn different wheel-throwing techniques to create personalized vases, ring holders, and heart-shaped bowls to last a lifetime. The Mother's Day sessions take place at 12:30 p.m., 3 p.m., and 5:30 p.m. and cost $65 per person. Usually, you think of getting Mom out of the kitchen on her special day, but if the mom in your life really enjoys the gourmet cooking experience or would like to improve her kitchen skills, joining her for a Mother's Day cooking class at EATZ may be just the present for her. Of course, you'll get to eat your tasty dishes afterward! The $105 fee includes all food, wine, and cocktails. Mother's Day Champagne Sunday Brunch is served in the Grand Salon aboard the stately Queen Mary in Long Beach. The brunch includes a carving station, Pacific Rim options, a Mexican buffet, a breakfast buffet, an omelet station with pancakes and waffles, a salad and cheese table, and a multitude of desserts. Live entertainment and free-flowing champagne make it a festive occasion. Reservations recommended. Special Mothers' Day menus are also available at Sir Winston's and Chelsea Chowder House aboard the ship. This special occasion costs $69.95, plus tax and gratuity. Treat mom to a Mexican brunch with music by Corazon de Mariachi at iXTapa Cantina in Pasadena. All of iX Tapa's classic favorites—like their sangria, tacos, and bacon-wrapped hotdogs are on offer. The brunch has two seatings (11:30 a.m. and 2:30 p.m.) and costs $64. The Aquarium of the Pacific puts on a feast with the fishes for Mother's Day Brunch. Brunch, which costs $69 for adults, includes admission to the museum where you can enjoy more than 11,000 different kinds of aquatic life. Past menus have includes dishes like a spinach frittata, applewood smoked bacon, a strawberry-feta balsamic salad, and more. Lighten up Mom's day with a little sleight of hand, mind reading, and sketch comedy at Magicopolis in Santa Monica with Mother's Day Magic Show and champagne treat. The entertaining show is more like live theater than your typical stale magic show—past performances have included illusions, mind-reading, and Houdini-inspired escape. The cost is $30 per person. If the mom you're celebrating is the mother of your children, as opposed to your own mom, a romantic dinner away from the kids and the kitchen might be appropriate. 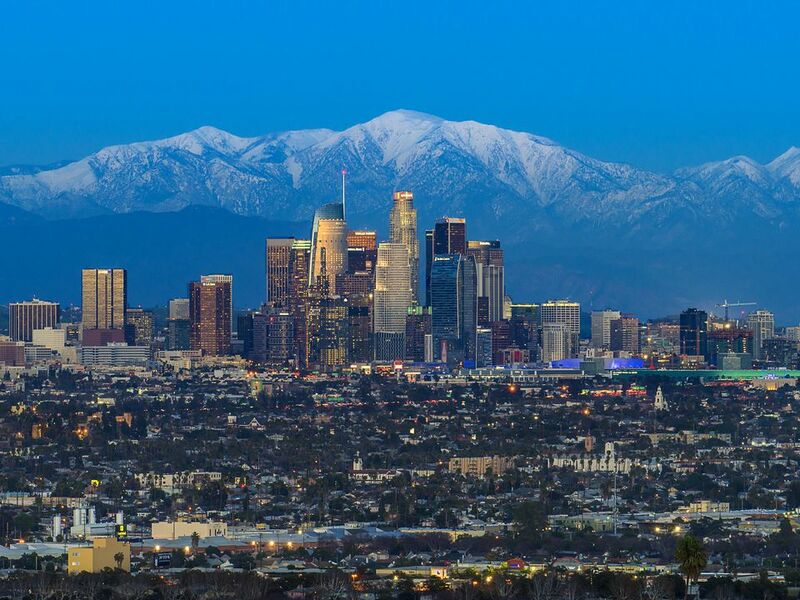 Try any one of these romantic Los Angeles restaurants with a view. 12 Cool Ways to Celebrate Mother's Day in L.A.